This new exhibition centres on the final message written by Captain Scott to his wife and son - on public display for the first time. Descendants of the famous explorer have donated the correspondence between Scott and his wife, the sculptress Kathleen, to the Scott Polar Research Institute Museum. The collection also includes letters sent by his wife and his young son, who was just learning to write at the time of his father's doomed expedition to the South Pole. Three-year-old Peter sent two messages to his father as his mother anxiously awaited news of Scott's return in 1912. One says: "Dear Daddy I am going to be a drummer" and the other simply "I love you". Tragically, the little boy's letters never reached his father – Scott and his fellow-explorers had already succumbed to extreme frostbite, malnutrition and exhaustion as they fought their way across the Antarctic. For the first time, scholars and members of the public will also be able to examine Scott's own, deeply moving final letter home. Dated March 1912 and addressed "To my widow", the document was found in his tent when the team's bodies were recovered in 1913. Scott wrote it on scraps of his journal over a period of days as he and his companions tried to battle their way back from the Pole in blizzard conditions and unimaginable cold. At the start of 1912 they had arrived at the Pole only to discover that the Norwegian explorer, Roald Amundsen, had already attained the Pole a month earlier. As they began the long and demoralising journey back, very bad weather set in. Despite valiant claims in the letter that he and his companions were "full of good health and vigour", the desperate nature of the group's situation soon became clear. In one passage, Scott told Kathleen: "Dear, it is not easy to write because of the cold – 70 degrees below zero and nothing but the shelter of our tent. You know I have loved you; you know my thoughts must have constantly dwelt on you… the worst aspect of this situation is that I shall not see you again – the inevitable must be faced." As the position became more hopeless, Scott began to consider how his family would cope. The letter reveals that he encouraged his wife to re-marry, partly for the sake of their young son. "When the right man comes to help you in life you ought to be your happy self again," he wrote. "I wouldn't have been a very good husband, but I hope I shall be a good memory. Certainly the end is nothing for you to be ashamed of and I like to think that the boy will have a good start in parentage of which he may be proud." Scott and his remaining two companions were just 11 miles short of their supply depot when they finally perished. Many of his final thoughts concerned Peter and he encouraged Kathleen to try to make him interested in natural history. "It is better than games," he commented, before adding: "Try and make him believe in a God; it is comforting." Sir Peter Scott, as he became, did indeed follow in his father's footsteps, first by serving with distinction in the Royal Navy and, after World War II, by pursuing a celebrated career in ornithology. Now his widow, Lady Philippa Scott, has given the letters to the Scott Polar Research Institute, which was established in memory of Captain Scott and his team. The gift means that Cambridge now houses the complete collection of Scott's correspondence, which includes more than 300 letters. These will be kept in the Institute, which also houses the explorer's famous journal and numerous other artefacts from his ill-fated expedition, including food and expedition equipment. Institute Director, Professor Julian Dowdeswell, said: "We are tremendously grateful to the family for this generous gift, without which Scott's final and most poignant letters might easily have been lost to a private collector. Instead they will prove invaluable in enabling us to continue our historic role as an international centre for the study of the Polar regions." Robert Falcon Scott was born on 6 June 1868 at Outlands near Devonport, the third child of Hannah and John Scott. He was sent to Stubbington House, Fareham, Hampshire to be coached for a cadetship in the Royal Navy and joined the training ship HMS Britannia at the age of thirteen. After spending the winter of 1887-1888 at the Royal Naval College in Greenwich, passing his examination for the rank of lieutenant in 1888, he was commissioned as a sub-lieutenant and service in the Pacific was followed by a brief spell in the Mediterranean before in September 1891 he reported on board the torpedo training ship, HMS Vernon, for a two-year course. Scott emerged with first-class certificates in all subjects. Within two days of first hearing of the proposed British National Antarctic Expedition, Scott had applied for the command. He was appointed in June 1900 and later in the same month was promoted to the rank of Commander. Recruiting a company of Royal Navy and Merchant Navy seamen aboard the purpose-built expedition ship Discovery, and with a strong scientific team, the expedition sailed from New Zealand on 21 December 1901, wintering at Hut Point, Ross Island. The expedition was highly successful, having made the first extensive exploration on land in Antarctica and producing many volumes of scientific results. On his return, Scott was promoted to Captain, decorated and wrote a book on the expedition, The voyage of the Discovery. This was followed by postings to HMS Victorious in 1906, HMS Albemarle in 1907 and HMS Essex in 1908. Later in 1908, he was appointed commander of HMS Bulwark and in September, he married Kathleen Bruce, a talented sculptress. Scott was appointed Naval Assistant to the Admiralty in 1909, but was motivated to plan an expedition to the South Pole by the success of the British Antarctic Expedition, 1907-1909 led by Ernest Shackleton who had located the Pole on the featureless high ice plateau, and had come within 97 nautical miles of it. Scott returned to the Antarctic with the British Antarctic Expedition, 1910-1913, wintering at Cape Evans on Ross Island. He led a strong scientific team, both naval and civilian, that included several companions from his previous expedition. Scott started out for the Pole in late October 1911. With the aid of experimental tractors, dog teams and ponies, he followed his previous route across the Ross Ice Shelf before resorting to man-hauling up the Beardmore Glacier in Shackleton's footsteps. 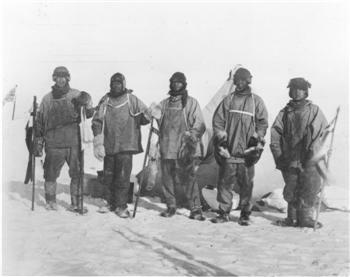 The five-man polar party successfully traversed the plateau, reaching the South Pole on 17 January 1912, to find that Amundsen had reached the Pole on 14 December 1911. On the return journey, the weakened party faced exceptionally unfavourable weather and sledging conditions. Edgar Evans died near the foot of the Beardmore Glacier. Lawrence Oates famously left the tent in a blizzard for the good of the party on 16 March 1912. Scott, Bowers and Wilson died at the end of March 1912, trapped in their tent by a blizzard, just 11 miles short of One Ton Depot. When Scott's last words, "For God's sake look after our people", were made known to the British nation, the public response was tremendous. Scott himself had emphasised the importance of science and, from this plea, the Scott Polar Research Institute was raised as the national memorial to the Polar party. Kathleen Bruce was born at Carlton-in-Lindrick, near Worksop, on 27 March 1878, eleventh child of the Reverend Lloyd Bruce. She studied art at the Slade School of Art in London and also at the Academie Colarossi in Paris, where she learnt to sculpt with Rodin, and in Florence. 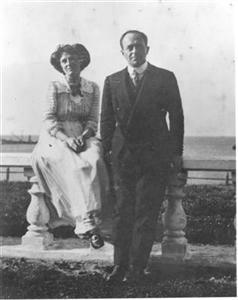 She was an established sculptress when she met Robert Falcon Scott in 1907, marrying him in September 1908 and giving birth to their son, Peter, in September 1909. In 1910, she accompanied her husband to New Zealand, from where he set off on the British Antarctic Expedition. In February 1913, whilst travelling back to New Zealand in order to greet the polar party, she learned that Scott had died in late March 1912, on his return journey from the South Pole. In recognition of her husband's achievements, she was accorded the rank, style and precedence of the wife of a Knight Commander of the Order of Bath. In 1922, she married Edward Hilton Young, MP for Norwich, by whom she had a son, Wayland, in 1923. In 1935, Young was raised to the Peerage as Baron Kennet. Baroness Kennet, who continued to work professionally under the name of Scott, died in July 1947. A bronze statue of Robert Falcon Scott by Kathleen Scott stands in Waterloo Place, London, and a marble statue of the same design is situated in Christchurch, New Zealand. A bronze statue of Edward Wilson by Kathleen Scott, unveiled by Sir Clements Markham in 1914, is to be found in Cheltenham. Among her many other sculptures is a statue entitled Lux perpetua luceat eis, which stands in the garden of the Scott Polar Research Institute in Cambridge. The Institute also has a bust of Robert Falcon Scott, sculpted by his wife, in the entablature above the original entrance.